Bacteria respond to light through the action of a protein structure called a LOV domain. This image shows the three-dimensional structure of a LOV domain from a plant protein. Image courtesy of Sean Crosson, University of Chicago. The bacteria that cause brucellosis can sense light and use the information to regulate their virulence, according to a study in the August 24 issue of the journal Science. The discovery comes after 120 years of research into the disease, which causes abortions in livestock and fevers in humans. Researchers found that two other bacteria, including a species that attacks plants, sense light using the same type of protein structure, and at least 94 more species possess the code for it in their DNA. "These bacteria have been very well studied for years, and no one knew they could sense light," said lead author Trevor Swartz, who initiated the study as a research scientist at the University of California, Santa Cruz. "Now it seems like it's a common thing rather than being an anomaly." The ubiquity of the structure suggests that light may play a much more important role in bacterial life than has previously been recognized. And because the recurrent structure can be paired with a variety of signaling proteins, it gives organisms immense versatility in the ways they use light, Swartz said. "We have bumped into an entirely new family of light receptors in nature," said coauthor Roberto Bogomolni, professor of chemistry and biochemistry at UCSC. The receptor molecule contains a light-sensing region known as an LOV domain because it resembles similar units in other proteins that sense light, oxygen, or voltage, said coauthor and longtime collaborator Winslow Briggs, of the Carnegie Institution of Washington. The structure crops up in a variety of proteins, where it lends its light-sensing ability to the whole molecule. The light-sensing structure is very different from either the light-harvesting molecules of photosynthesis or the light-gathering pigments in our own eyes. LOV domains were discovered 10 years ago in plant molecules called phototropins. The molecules enable plants to do crucial tasks, such as growing toward light and sensing day length. Why so many bacteria should possess the same type of equipment has been harder to understand. To pin down the LOV domain's light-sensing function in bacteria, researchers selected four species whose DNA contained genes for the structure: Brucella melitensis, B. abortus, Pseudomonas syringae (a well-studied plant pathogen), and Erythrobacter litoralis, a common bacterium in sea water. They spliced the genes into Escherichia coli, a lab-friendly bacterium that is easy to work with. Then they grew the bacteria in a darkened lab and tracked molecular activity with radioactive tracers. When flashed with a strobe light, the LOV domains immediately changed shape, forming a temporary bond in a process that Bogomolni likened to the opening of a hinge. When open, the hinge exposes the rest of the protein and activates it. When darkness returns, the bonds break and the LOV domain swings shut. The light-receptor protein includes an enzyme called histidine kinase that, when exposed by activation of the LOV domain, marks other molecules using phosphate as a tag. A second component of the signaling system, called a response regulator, relays the signal to the rest of the cell by transferring the phosphate tag to other molecules. The secret to the versatility of such two-component systems lies in the variety of molecules available to be tagged. For example, even though LOV domains are nearly identical between plants and bacteria, the subsequent signaling steps are completely different, said Swartz, who is now a researcher at Genentech. When Brucella comes under attack from a host's immune system, light received by the LOV domain activates the bacterium's counter-defenses, allowing it to reproduce rapidly and making it highly virulent. In the dark, without these defenses activated, Brucella's division rate drops by 90 percent. When the team grew experimental Brucella in the light but with the LOV domain disabled, they found an identical drop in division rate. Swartz and Bogomolni are still not sure how the regulation of virulence by light benefits the pathogen. They suspect that it allows the bacterium to determine when it is outside of its host--such as when a cow's infected fetus has been aborted and is lying in the field. By increasing its virulence under those circumstances, the bacteria are more likely to survive and infect a new host. Understanding how bacteria respond to light could lead to therapeutic advances. 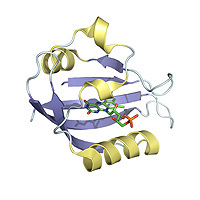 For example, histidine kinases are unknown in animals. So, if a drug were developed that could disable histidine kinase activity, it could fight bacteria without causing side effects in animals, Bogomolni said. "We are beginning to understand what we like to call the molecular calisthenics that go on," Bogomolni said. "But we still don't know what is happening at the cellular level, and that will require years of research to find out." In addition to Swartz, Bogomolni, and Briggs, the paper's authors include Marcus Frederickson, a UCSC graduate student; Tong-Seung Tseng of the Carnegie Institution of Washington; GastÃ³n Paris and Fernando Goldbaum of the Leloir Institute Foundation at CONICET, Argentina; Diego Comerci and Rodolfo Ugalde of the National University of San MartÃ­n, Argentina; Gireesh Rajashekara and Gary Splitter of the University of Wisconsin; and Jung-Gun Kim and Mary Beth Mudgett of Stanford University. Note to reporters: You may contact Bogomolni at (831) 459-4294 or bogo@chemistry.ucsc.edu.